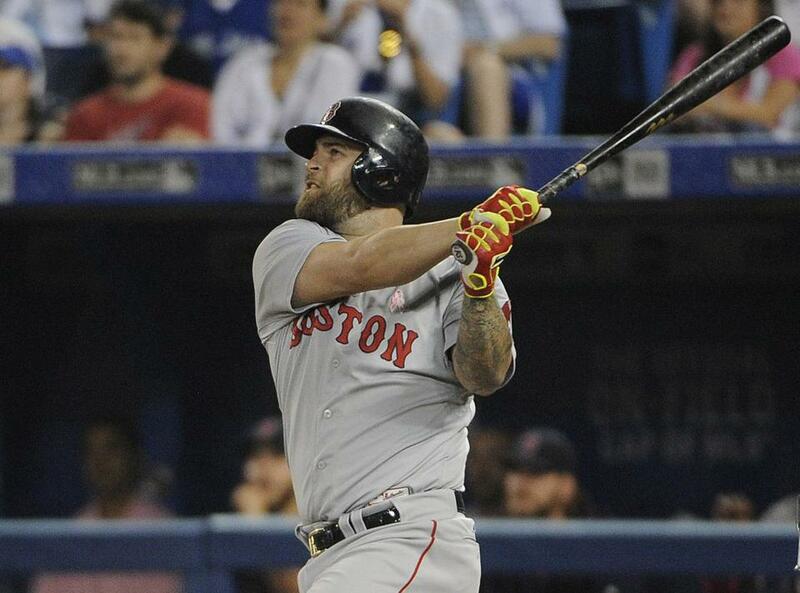 Mike Napoli hits a three-run homer in the first inning against the Blue Jays’ R.A. Dickey at Rogers Centre. TORONTO — The list of contributions David Ortiz can make to a baseball team usually does not include breaking up a double play. Ortiz is 39 and plays with both ankles heavily wrapped to protect sore Achilles’ tendons. His running style can charitably be described as cautious. Yet there was Ortiz on Sunday afternoon, bearing down on Toronto Blue Jays second baseman Devon Travis in the first inning, determined to keep him from turning a double play after Hanley Ramirez grounded to third base. Travis, distracted just enough, was late with his throw to first. The players in the Red Sox dugout congratulated Ortiz when he returned as though he had hit a home run. We’re not calling this an All-Star outing, but it was better than we’ve seen in a while. The burst of hustle from Big Papi proved important. Pablo Sandoval doubled and then Mike Napoli launched a home run to center field off R.A. Dickey. The four-run first inning propelled the embattled Sox to a 6-3 victory. “For us to come out and score four runs in the first, maybe it let our guys relax a little bit,” manager John Farrell said. The Red Sox held a players-only meeting on Saturday after losing for the seventh time in eight games and falling deeper into last place. Ortiz, one of the speakers, implored his teammates to do the little things necessary for winning. Napoli entered the game hitting .165 with seven RBIs. When Dickey left a knuckleball high, Napoli drove it into the bleachers in center. That the home run came on Mother’s Day seemed appropriate to Napoli. His mother, Donna Rose Torres, was at the game in a front-row seat. Napoli has his mother’s signature and a rose tattooed on his left arm and the two are close. It was evident from the start that the Red Sox were determined to ease some of the tension enveloping the team. Leadoff hitter Mookie Betts saw eight pitches from Dickey before lining a triple to center field, the ball just getting past the dive of Kevin Pillar. Dustin Pedroia drove in the run with a ground out before Ortiz walked. 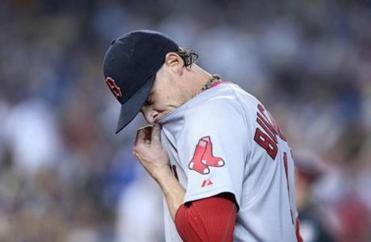 Once the inning opened up, Clay Buchholz had a big lead to work with. The Red Sox are 9-2 when they score first. Buchholz worked 6⅓ solid innings for his first victory since Opening Day. Buchholz (2-4) allowed three runs but kept the game under control. Buchholz walked three in the first inning, but a double play turned by Pedroia helped him escape damage. Buchholz twisted his left ankle on the final play of the fourth inning but stayed in the game. He left Rogers Centre with a wrap on his ankle. “My left foot landed in the hole [on the mound], but I had taped my ankles so it wasn’t as bad at it could have been,” Buchholz said. Ramirez singled and Sandoval homered to right field in the fifth inning. After scoring one run in the first two games of the series, the Sox saw their pop return on Sunday. “That was the way we should play the game. That’s the way we expect to play the game,” Napoli said. Junichi Tazawa and Koji Uehara finished the game. It was the sixth save for Uehara and the 100th of his career in Nippon Professional Baseball and the major leagues. The Sox have seven more games on their road trip starting Monday night in Oakland. Ortiz, Napoli, and others spoke about Sunday being a new start for the team.